Helen is a qualified Homeopathic Practitioner, and graduate of the renowned School of Homeopathy in Stroud. She qualified after many years of study, with over 140 hours of clinical observation and 18 months of in-service supervision. To be able to qualify and practice homeopathy is a privilege. It’s been an inspirational experience for Helen, coming to fruition after many years of study. Helen also studied on parallel courses, gaining Diplomas in Anatomy & Physiology and Pathology & Disease for Homeopaths with Alternative Training, Stroud. To be able to practice homeopathy is a dream come true, a dream that Helen stumbled upon some 20 years ago, when treating her daughters for childhood illnesses. To even be a little help to someone who is seeking that ‘something’ extra, that ‘something’ that can help their own journey to health and wellbeing is rewarding to her as a person and as a practitioner. Welcome to Effective Hay Fever Prevention Program. I have worked with many clients with hay fever using homeopathic remedies over the years, but usually only during the hay fever season. One of the strategies is to use remedies made from pollen and grass to build up resistance, along with individualised constitutional remedies, plus further remedies to address the allergic disposition. It's been found that this treatment is effective even when 'anti-histamine' resistance has built up. The treatment desensitises and strengthens the immune system and is prescribed during this dormant period, during the Autumn and Winter. 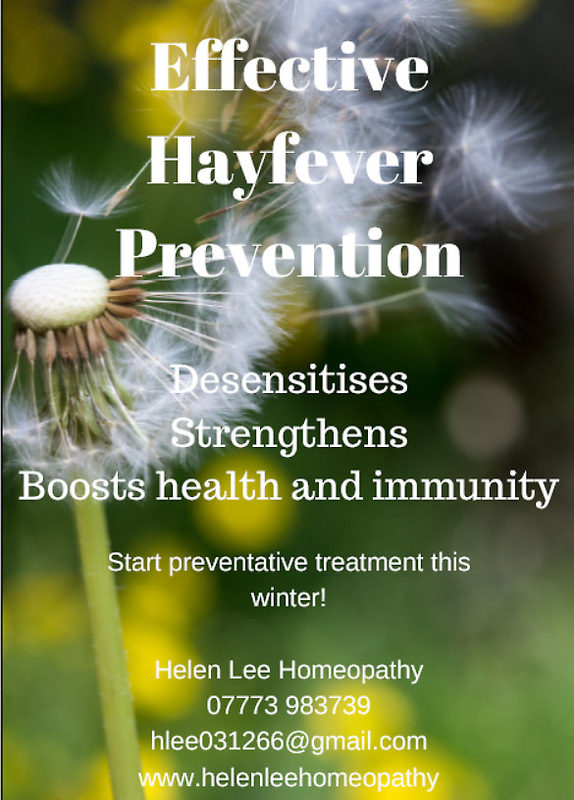 With further remedy support during the hay fever season. of The New Body Barn.